Floods can cause costly damage to your home; you may lose a lot of sentimental items. While floods can certainly be devastating, the good news is that they can be entirely prevented or at least have their damaging potential reduced by simply taking a few precautions that may only take a few hours or days to complete. 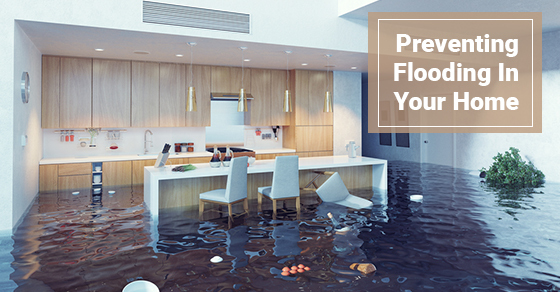 In addition to ensuring that your home will be covered by insurance in the event of a flood, here are some additional tips to prevent flooding in your home. Exposed pipes can freeze during the winter months if not protected. Frozen pipes will then crack or burst, leading to a flood and potential water damage in your home. To prevent this from happening, it is important to insulate your pipes with heat tape or pipe insulation, wrapping all exposed pipes in any unheated areas of your home. This not only includes small leaks in the plumbing system of your home but also includes repairing leaky roofs or any cracks in the foundation of your home. Even a small amount of water getting into your home can cause mold to grow and weaken your home’s structure. If you notice any wet spots on your ceiling, for example, fix them immediately. If you notice that the toilets in your home create a sewage backup, this may signal that your main sewer line is clogged. To prevent this from happening, don’t flush anything but toilet paper down your toilets. Don’t put grease in your drain. Never use drain cleaners, as the chemicals in these cleaners actually corrode your pipes. Lastly, be careful about tree roots that may be near your sewer line. Even if you don’t have trees near your sewer lines, roots from a nearby yard could also cause your sewer to back up. Ensure that you keep your gutters and drainage system clean. Don’t forget to keep the storm drains near your home clean as well, as debris and foliage such as leaves can collect and cause water to build up. If you are in need of a plumber to resolve a plumbing problem in your high-rise or house, contact our team of plumbing experts at Brothers Plumbing today. We have over 50 years in the business and a superior track record in the industry. We offer competitive rates, upfront quotes and 7-7-7 service.